I think almost everyone loves peacocks, and besides putting feathers on a hat, I think having them in your hair is the best way to wear them. Very cute, can be worn by children or adults in casual or formal settings. These look gorgeous in my daughters hair and she says they are to wear with her jeans when school starts back up in the fall. Sounds like she has it all planned out. 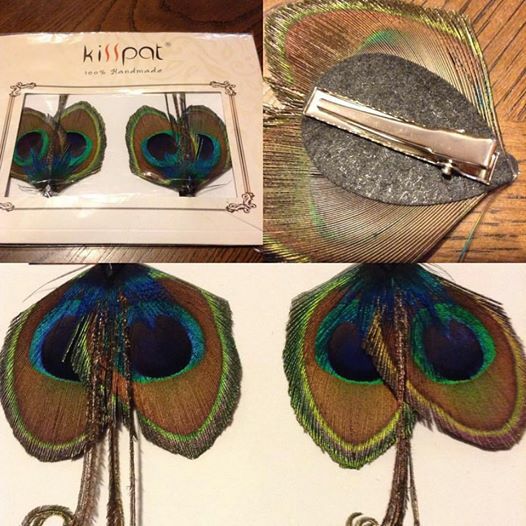 The clip is made so you can put them in your hair, on a hat, bag, or even attach to your clothing such as a scarf this would be a wonderful touch to many scarves out there. I have one from my mother that this would look fabulous with. I hope my daughter lets me borrow these to wear myself. What KISSPAT has to say about their product. Top quality guaranteed, no glue or dirt on item, feathers will be arrived with perfect shape & condition as pictures. Disclosure: MarksvilleandMe received one or more of the products mentioned above as part of a promotion with Tomoson and Cathy Trading. Regardless, MarksvilleandMe only recommends products or services we use personally and believe will be good for our readers. Some of the links in the article may be “affiliate links.” This means if you click on the link and purchase the item, I will receive compensation. If you would like MarksvilleandMe to review a product or service please contact us at marksvilleandme@gmail.com.